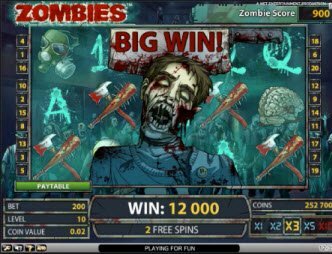 The Zombies slot machine features 5 reels, 20 paylines, and a whole lot of awesome zombie themed graphics. The Zombies Slot Machine tells a scary story. It appears that vessels of toxic chemicals have wreaked havoc on the population, turning everyone into flesh eating zombies. You’ve taken shelter at the local mall, fighting against the hoards with chain saws, baseball bats, and axes. Now the only thing you have left to do is spin the reels of chance and find out if you win big cash payouts! With a name like Zombies, you can expect that this game will be nothing short of awesome. I’m glad to see Netent gaming software behind this one because they tend to do an excellent job. I love the radioactive letter and numbers and creepy background sound effects. The graphics definitely portray the Post-Apacolyptic feel associated with the zombie genre. Although the graphics didn’t stand out as the best I’ve ever seen, for any others out like me who have an unhealthy obsession with anything Zombie, you gotta check this one out. Although the graphics didn’t stand out as the best I’ve ever seen, for any others out like me who have an unhealthy obsession with anything Zombie, you gotta check this one out. The toxic chemical serves as the Scatter Symbol. If it appears anywhere on reels 2, 3, and 4, it activates 5 Free Spins. Each zombie shot during the Free Spins Feature awards a coin based on the bet level of the round. 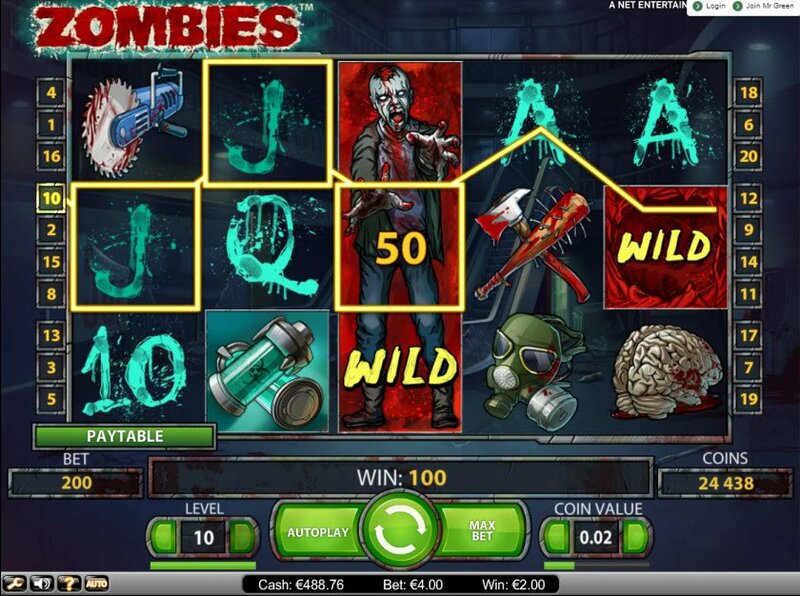 The Zombies slot machine also contains a Stacked Wild which appears on reel 3. If only part of the Stacked Wild appears, it nudges up or down covering the whole reel, increasing chances for winning combinations. 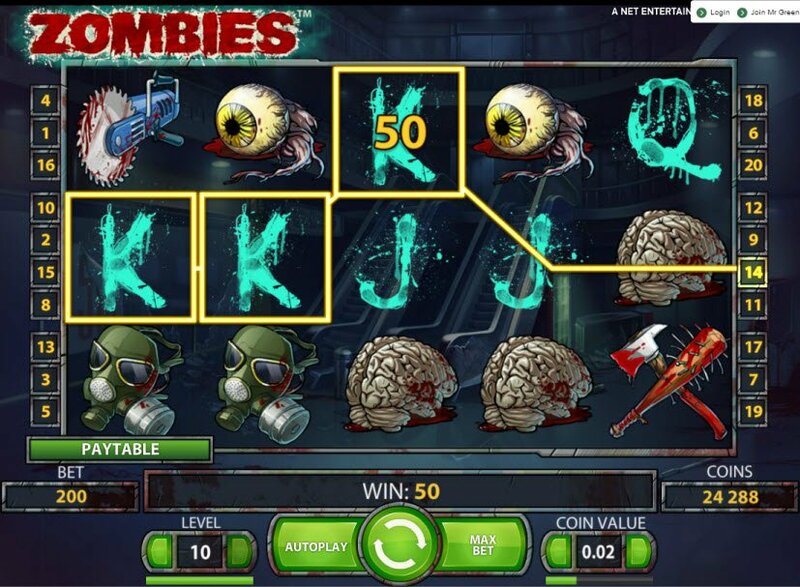 The Zombies slot machine makes it easy to understand the different icons and their payouts. Simply click on reel symbols as you play, and the payout amount will appear right there. I’ve never noticed this feature on other slots, making this a standout in terms of features. I think it’s cool that they finally made a slot machine with zombies. I give this one 100%!